Usage data from Apple's two largest markets is showing a significant increase in buyers' preference for the large display of iPhone 6 Plus as supply increases, indicating a richer profit mix destined to polish the company's earnings. New usage data reported by AppLovin indicates that Apple's more expensive, 5.5 inch iPhone 6 Plus is incrementally increasing in its popularity when compared to the 4.7 inch iPhone 6 model, in both the U.S. and in China. In late November, the firm reported that iPhone 6 Plus accounted for 20 percent of U.S. usage and 35 percent in China in data observed through the end of October. 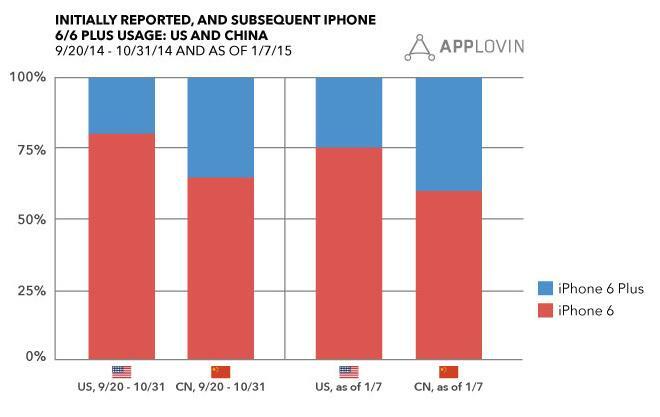 Through the first week of January however, the adoption ratio for iPhone 6 Plus increased 5 percentage points in both markets, reaching 25 percent in the U.S. and 40 percent in China. "This much movement in two of the largest smartphone markets is significant, especially if you consider that these new ratios aren't just for new sales of devices," the company explained. "Because the original devices sold in the first month and a half of the availability at a 80/20 or 65/35 pace are still active--the new devices added have to dilute the original ratios." The usage data may indicate that buyers of the larger model are using it more, the initially constrained supplies of iPhone 6 Plus indicate, as the firm states, "the iPhone 6 Plus is booming--and all indications are that demand for this device outstripped demand by a wide margin." Independent research by Morgan Stanley analyst Katy Huberty provided even richer preference ratios for iPhone 6 Plus, the the U.S. (26 percent) but principally in China, where 51 percent of buyers said they planned to buy Apple's largest phone. Those numbers also included iPhone 5s and "other iPhone" as options in the mix. Huberty also highlighted the higher Average Selling Price and profit margin of iPhone 6 Plus over the base iPhone 6, and the fact that more than half of all buyers (of both iPhone 6 and 6 Plus) were opting to splurge for the premium priced 64GB or 128GB tiers, which deliver even higher margins, as much as 61 percent greater than the 16GB entry models.